A wash for the apathetic middle? What about formal standardized tests? Last year, I asked LW for some advice about spaced repetition software (SRS) that might be useful to me as a high school teacher. With said advice came a request to write a follow-up after I had accumulated some experience using SRS in the classroom. This is my report. Please note that this was not a scientific experiment to determine whether SRS "works." Prior studies are already pretty convincing on this point and I couldn&apos;t think of a practical way to run a control group or "blind" myself. What follows is more of an informal debriefing for how I used SRS during the 2014-15 school year, my insights for others who might want to try it, and how the experience is changing how I teach. SRS can raise student achievement even with students who won&apos;t use the software on their own, and even with frequent disruptions to the study schedule. Gains are most apparent with the already high-performing students, but are also meaningful for the lowest students. Deliberate efforts are needed to get student buy-in, and getting the most out of SRS may require changes in course design. After looking into various programs, including the game-like Memrise, and even writing my own simple SRS, I ultimately went with Anki for its multi-platform availability, cloud sync, and ease-of-use. I also wanted a program that could act as an impromptu catch-all bin for the 2,000+ cards I would be producing on the fly throughout the year. (Memrise, in contrast, really needs clearly defined units packaged in advance). I teach 9th and 10th grade English at an above-average suburban American public high school in a below-average state. Mine are the lower "required level" students at a school with high enrollment in honors and Advanced Placement classes. Generally speaking, this means my students are mostly not self-motivated, are only very weakly motivated by grades, and will not do anything school-related outside of class no matter how much it would be in their interest to do so. There are, of course, plenty of exceptions, and my students span an extremely wide range of ability and apathy levels. First, what I did not do. I did not make Anki decks, assign them to my students to study independently, and then quiz them on the content. With honors classes I taught in previous years I think that might have worked, but I know my current students too well. Only about 10% of them would have done it, and the rest would have blamed me for their failing grades—with some justification, in my opinion. Instead, we did Anki together, as a class, nearly every day. As initial setup, I created a separate Anki profile for each class period. With a third-party add-on for Anki called Zoom, I enlarged the display font sizes to be clearly legible on the interactive whiteboard at the front of my room. concepts and terms, often with reversed companion cards, sometimes supplemented with "what is this an example of" scenario cards. grammar, usually in the form of "What change(s), if any, does this sentence need?" Alternative cards had different permutations of the sentence. Weekly, I updated the deck to the cloud for self-motivated students wishing to study on their own. Daily, I led each class in an Anki review of new and due cards for an average of 8 minutes per study day, usually as our first activity, at a rate of about 3.5 cards per minute. As each card appeared on the interactive whiteboard, I would read it out loud while students willing to share the answer raised their hands. Depending on the card, I might offer additional time to think before calling on someone to answer. Depending on their answer, and my impressions of the class as a whole, I might elaborate or offer some reminders, mnemonics, etc. I would then quickly poll the class on how they felt about the card by having them show a color by way of a small piece of card-stock divided into green, red, yellow, and white quadrants. Based on my own judgment (informed only partly by the poll), I would choose and press a response button in Anki, determining when we should see that card again. 8 minutes is a significant portion of a 55 minute class period, especially for a teacher like me who fills every one of those minutes. Something had to give. For me, I entirely cut some varieties of written vocab reinforcement, and reduced the time we spent playing the team-based vocab/term review game I wrote for our interactive whiteboards some years ago. To a lesser extent, I also cut back on some oral reading comprehension spot-checks that accompany my whole-class reading sessions. On balance, I think Anki was a much better way to spend the time, but it&apos;s complicated. Keep reading. Before we started using SRS I tried to sell my students on it with a heartfelt, over-prepared 20 minute presentation on how it works and the superpowers to be gained from it. It might have been a waste of time. It might have changed someone&apos;s life. Hard to say. As for the daily class review, I induced engagement partly through participation points that were part of the final semester grade, and which students knew I tracked closely. Raising a hand could earn a kind of bonus currency, but was never required—unlike looking up front and showing colors during polls, which I insisted on. When I thought students were just reflexively holding up the same color and zoning out, I would sometimes spot check them on the last card we did and penalize them if warranted. But because I know my students are not strongly motivated by grades, I think the most important influence was my attitude. I made it a point to really turn up the charm during review and play the part of the engaging game show host. Positive feedback. Coaxing out the lurkers. Keeping that energy up. Being ready to kill and joke about bad cards. Reminding classes how awesome they did on tests and assignments because they knew their Anki stuff. I also got my students more on the Anki bandwagon by showing them how this was directly linked reduced note-taking requirements. If I could trust that they would remember something through Anki alone, why waste time waiting for them to write it down? They were unlikely to study from those notes anyway. And if they aren&apos;t looking down at their paper, they&apos;ll be paying more attention to me. I better come up with more cool things to tell them! Everything I had read about spaced repetition suggested it was a great reinforcement tool but not a good way to introduce new material. With that in mind, I tried hard to find or create memorable images, examples, mnemonics, and anecdotes that my Anki cards could become hooks for, and to get those cards into circulation as soon as possible. I even gave this method a mantra: "vivid memory, card ready". We often had too many due cards to get through in one session, and by default Anki puts new cards behind due ones. By default, Anki only introduces 20 new cards in one session (I soon uncapped this). Some cards were in categories that I gave lower priority to. SRS is meant to be used every day. When you take weekends off, you get a backlog of due cards. Not only do my students take every weekend and major holiday off (slackers), they have a few 1-2 week vacations built into the calendar. Coming back from a week&apos;s vacation means a 9-day backlog (due to the weekends bookending it). There&apos;s no good workaround for students that won&apos;t study on their own. 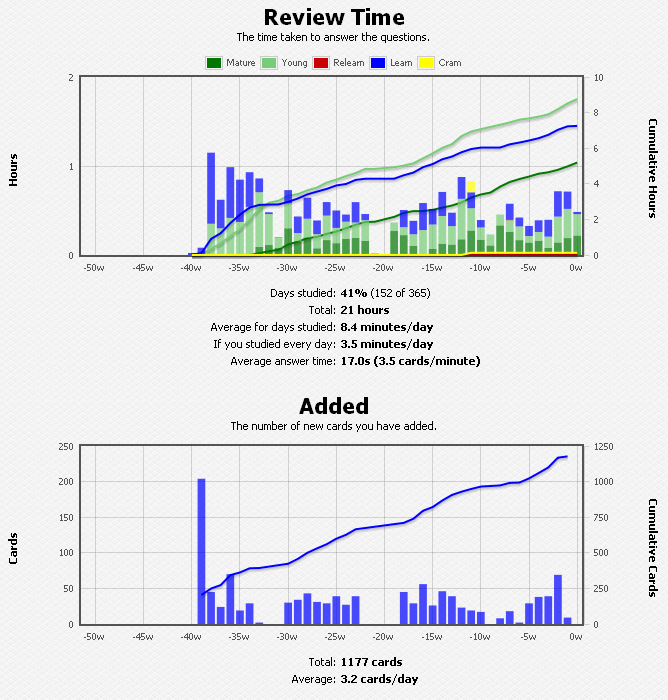 The best I could do was run longer or multiple Anki sessions on return days to try catch up with the backlog. It wasn&apos;t enough. The "caught up" condition was not normal for most classes at most points during the year, but rather something to aspire to and occasionally applaud ourselves for reaching. Some cards spent weeks or months on the bottom of the stack. Memories died. Baby cards emerged stillborn. Learning was lost. Never before SRS did I fully appreciate the loss of learning that must happen every summer break. I kept each course&apos;s master deck divided into a few large subdecks. This was initially for organizational reasons, but I eventually started using it as a prioritizing tool. This happened after a curse-worthy discovery: if you tell Anki to review a deck made from subdecks, due cards from subdecks higher up in the stack are shown before cards from decks listed below, no matter how overdue they might be. From that point, on days when we were backlogged (most days) I would specifically review the concept/terminology subdeck for the current semester before any other subdecks, as these were my highest priority. On a couple of occasions, I also used Anki&apos;s study deck tools to create temporary decks of especially high-priority cards. Veteran teachers start acquiring a sense of when it might be a good time to go off book and teach something that isn&apos;t in the unit, and maybe not even in the curriculum. Maybe it&apos;s teaching exactly the right word to describe a vivid situation you&apos;re reading about, or maybe it&apos;s advice on what to do in a certain type of emergency that nearly happened. As the year progressed, I found myself humoring my instincts more often because of a new confidence that I can turn an impressionable moment into a strong memory and lock it down with a new Anki card. I don&apos;t even care if it will ever be on a test. This insight has me questioning a great deal of what I thought knew about organizing a curriculum. And I like it. An accidental discovery came from having written some cards that were, it was immediately obvious to me, much too easy. I was embarrassed to even be reading them out loud. Then I saw which hands were coming up. In any class you&apos;ll get some small number of extremely low performers who never seem to be doing anything that we&apos;re doing, and, when confronted, deny that they have any ability whatsoever. Some of the hands I was seeing were attached to these students. And you better believe I called on them. It turns out that easy cards are really important because they can give wins to students who desperately need them. Knowing a 6th grade level card in a 10th grade class is no great achievement, of course, but the action takes what had been negative morale and nudges it upward. And it can trend. I can build on it. A few of these students started making Anki the thing they did in class, even if they ignored everything else. I can confidently name one student I&apos;m sure passed my class only because of Anki. Don&apos;t get me wrong—he just barely passed. Most cards remained over his head. Anki was no miracle cure here, but it gave him and I something to work with that we didn&apos;t have when he failed my class the year before. It&apos;s not even fair. The lowest students got something important out of Anki, but the highest achievers drank it up and used it for rocket fuel. When people ask who&apos;s widening the achievement gap, I guess I get to raise my hand now. I refuse to feel bad for this. Smart kids are badly underserved in American public schools thanks to policies that encourage staff to focus on that slice of students near (but not at) the bottom—the ones who might just barely be able to pass the state test, given enough attention. Where my bright students might have been used to high Bs and low As on tests, they were now breaking my scales. You could see it in the multiple choice, but it was most obvious in their writing: they were skillfully working in terminology at an unprecedented rate, and making way more attempts to use new vocabulary—attempts that were, for the most part, successful. Given the seemingly objective nature of Anki it might seem counterintuitive that the benefits would be more obvious in writing than in multiple choice, but it actually makes sense when I consider that even without SRS these students probably would have known the terms and the vocab well enough to get multiple choice questions right, but might have lacked the confidence to use them on their own initiative. Anki gave them that extra confidence. I&apos;m confident that about a third of my students got very little out of our Anki review. They were either really good at faking involvement while they zoned out, or didn&apos;t even try to pretend and just took the hit to their participation grade day after day, no matter what I did or who I contacted. These weren&apos;t even necessarily failing students—just the apathetic middle that&apos;s smart enough to remember some fraction of what they hear and regurgitate some fraction of that at the appropriate times. Review of any kind holds no interest for them. It&apos;s a rerun. They don&apos;t really know the material, but they tell themselves that they do, and they don&apos;t care if they&apos;re wrong. On the one hand, these students are no worse off with Anki than they would have been with with the activities it replaced, and nobody cries when average kids get average grades. On the other hand, I&apos;m not ok with this... but so far I don&apos;t like any of my ideas for what to do about it. For unplanned reasons, I taught a unit at the start of a quarter that I didn&apos;t formally test them on until the end of said quarter. Historically, this would have been a disaster. In this case, it worked out well. For five weeks, Anki was the only ongoing exposure they were getting to that unit, but it proved to be enough. Because I had given the same test as a pre-test early in the unit, I have some numbers to back it up. The test was all multiple choice, with two sections: the first was on general terminology and concepts related to the unit. The second was a much harder reading comprehension section. As expected, scores did not go up much on the reading comprehension section. Overall reading levels are very difficult to boost in the short term and I would not expect any one unit or quarter to make a significant difference. The average score there rose by 4 percentage points, from 48 to 52%. Scores in the terminology and concept section were more encouraging. For material we had not covered until after the pre-test, the average score rose by 22 percentage points, from 53 to 75%. No surprise there either, though; it&apos;s hard to say how much credit we should give to SRS for that. Some other time, I might try reserving a section of content that I teach before the pre-test but don&apos;t make any Anki cards for. This would give me a way to compare Anki to an alternative review exercise. I don&apos;t know yet. The scores aren&apos;t back. I&apos;ll probably be shown some "value added" analysis numbers at some point that tell me whether my students beat expectations, but I don&apos;t know how much that will tell me. My students were consistently beating expectations before Anki, and the state gave an entirely different test this year because of legislative changes. I&apos;ll go back and revise this paragraph if I learn anything useful. If I&apos;m trying to acquire a new skill, one of the first things I try to do is listen to skilled practitioners of that skill talk about it to each other. What are the terms-of-art? How do they use them? What does this tell me about how they see their craft? Their shorthand is a treasure trove of crystallized concepts; once I can use it the same way they do, I find I&apos;m working at a level of abstraction much closer to theirs. Similarly, I was hoping Anki could help make my students more fluent in the subject-specific lexicon that helps you score well in analytical essays. After introducing a new term and making the Anki card for it, I made extra efforts to use it conversationally. I used to shy away from that because so many students would have forgotten it immediately and tuned me out for not making any sense. Not this year. Once we&apos;d seen the card, I used the term freely, with only the occasional reminder of what it meant. I started using multiple terms in the same sentence. I started talking about writing and analysis the way my fellow experts do, and so invited them into that world. Even though I was already seeing written evidence that some of my high performers had assimilated the lexicon, the high quality discussions of these same students caught me off guard. You see, I usually dread whole-class discussions with non-honors classes because good comments are so rare that I end up dejectedly spouting all the insights I had hoped they could find. But by the end of the year, my students had stepped up. I think what happened here was, as with the writing, as much a boost in confidence as a boost in fluency. Whatever it was, they got into some good discussions where they used the terminology and built on it to say smarter stuff. Don&apos;t get me wrong. Most of my students never got to that point. But on average even small groups without smart kids had a noticeably higher level of discourse than I am used to hearing when I break up the class for smaller discussions. SRS is inherently weak when it comes to the abstract and complex. No card I&apos;ve devised enables a student to develop a distinctive authorial voice, or write essay openings that reveal just enough to make the reader curious. Yes, you can make cards about strategies for this sort of thing, but these were consistently my worst cards—the overly difficult "leeches" that I eventually suspended from my decks. A less obvious limitation of SRS is that students with a very strong grasp of a concept often fail to apply that knowledge in more authentic situations. For instance, they may know perfectly well the difference between "there", "their", and "they&apos;re", but never pause to think carefully about whether they&apos;re using the right one in a sentence. I am very open to suggestions about how I might train my students&apos; autonomous "System 1" brains to have "interrupts" for that sort of thing... or even just a reflex to go back and check after finishing a draft. Reduce the number of cards by about 20%, to maybe 850-950 for the year in a given course, mostly by reducing the number of variations on some overexposed concepts. Be more willing to add extra Anki study sessions to stay better caught-up with the deck, even if this means my lesson content doesn&apos;t line up with class periods as neatly. Be more willing to press the red button on cards we need to re-learn. I think I was too hesitant here because we were rarely caught up as it was. Rework underperforming cards to be simpler and more fun. Use more simple cloze deletion cards. I only had a few of these, but they worked better than I expected for structured idea sets like, "characteristics of a tragic hero". Take a less linear and more opportunistic approach to introducing terms and concepts. Allow for more impromptu discussions where we bring up older concepts in relevant situations and build on them. Shape more of my lessons around the "vivid memory, card ready" philosophy. Continue to reduce needless student note-taking. Keep a close eye on 10th grade students who had me for 9th grade last year. I wonder how much they retained over the summer, and I can&apos;t wait to see what a second year of SRS will do for them. Suggestions and comments very welcome!